The 1971 film A Lizard In A Woman’s Skin is a story of greed, love, lust, repressed desires, bloody murder, and two rather hateful hippies. It’s a surreal tale that manages to combine LSD, politics, therapy, and a good old-fashioned whodunit. It’s a film that clearly a product of the late 60s and the early 70s and yet, it’s also a film that is so shamelessly sordid and wonderfully strange that it feels timeless. And not surprisingly, it was directed by Lucio Fulci. Over the course of his career, Lucio Fulci was credited with directing 56 films and one television miniseries. Though we tend to primarily think of Fulci as being a horror director, he actually worked in every genre. He directed peplums. He was responsible for some of the best and most violent spaghetti westerns ever made. He even directed comedies and an adaptation of Jack London’s White Fang! Still, it is for his horror films that Fulci is best-remembered and his non-compromising and frequently surreal style was perfect for the genre. Though 1979’s Zombi 2 is frequently cited as Fulci’s first excursion into the horror genre, he had actually dabbled in it before with a set of stylish and violent giallo films that he directed in the early 70s. For example, A Lizard In A Woman’s Skin deals with a horrific crime and features some of Fulci’s most striking and disturbing images. The film deals with Carol Hammond (Florida Bolkan), who is the daughter of a politician (Leo Genn) and the wife of a wealthy attorney (Jean Sorel). Carol is haunted by bizarre dreams involving her decadent neighbor, Julia Durer (Anita Strindberg). In her latest dream, Carol not only has a sexual encounter with Julia but also stabs her to death immediately afterward! It’s only after Julia’s dead that Carol realizes that she’s being watched by two hippies, who appear to be amused by the whole thing. After telling her therapist about the dream, Carol learns that Julia Durer has indeed been murdered. In fact, she was stabbed in exactly the same way that Carol saw in her dream! Was it just a dream or did Carol really murder of Julia? Or did someone find out about her dream (which she recorded in her journal) and then murder Julia in order to frame her? But who would want to do that? Could it be maybe her weaselly husband, who is having an affair with his secretary? Or maybe someone looking to embarrass her father? And what about the two hippies? It turns out that they’re real and they have a story of their own tell…. The mystery at the heart of A Lizard In A Woman’s Skin is a convoluted one and while the film’s plot did hold my interest, this film is less about the story and more about the way that Fulci tells it. Dealing with hippies, visions, LSD, and a potentially unstable protagonist gave Fulci whatever excuse he needed to turn Lizard In A Woman’s Skin into a surrealistic carnival ride of psychedelic images and sexually-charged dream sequences. From Carol’s nightmares to the scene where an intruder chases Carol through a sanitarium, A Lizard In A Woman’s Skin is full of strange images that are designed to keep the viewer just as off-balance as Carol. The film’s most shocking scene — which involves Carol coming across four dogs being used in a medical experiment — actually led to Fulci and special effects artist Carlo Rambaldi being taken to court and forced to prove that the dogs in the scene weren’t real. (Fortunately, Rambaldi brought his dog props to court with him.) It’s a shamelessly sordid film, one from which you will not be able to divert your eyes. Florinda Bolkan gives a great and sympathetic performance was Carol while Antia Strindberg is properly decadent as Julia. Penny Brown and Mike Kennedy plays perhaps the most hateful and callous hippies of all time and Kennedy especially makes a strong impression. Trust Lucio Fulci to make a film where the hippies are just as frightening as the zombies who populated his later work! A Lizard in A Woman’s Skin is a classic giallo and one of Fulci’s best. In some places it’s already Halloween but here on the West Coast it is still a few more hours til the best night of the year arrives. There was one film when I was really young which scared the hell out of me and when I think about it now I have to say that it probably will still cause me to lose hours of sleep over it. It’s a horror/sci-fi film from Spain and released in 1972. 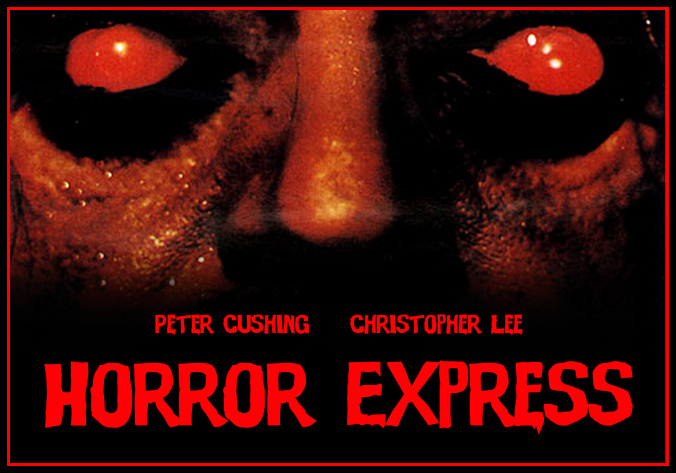 Horror Express was directed by Spanish filmmaker Eugenio Martin and starred two titans of the gothic horror scene of the 60’s and 70’s in Christopher Lee and Peter Cushing. It also starred Telly Savalas in quite the creepy and sadistic role as a Cossack captain. When the film was made the horror genre scene was still hanging onto the gothic aesthetics of the very popular Hammer Films which dominated the genre from the 60’s and into the early 70’s. While the Herschel Gordon Lewis bloodsplatter exploitation films and Romero’s own Night of the Living Dead was the beginning of the move to more violent and gory films that would see it’s gain strength in the 70’s this film from Spain was unique in that it tried to do have that Hammer Films look in addition to some gory work (though still tame to what would arrive years later). Horror Express was all about a Transsiberian express train on the way back to Europe with some Russian royalty on-board and a particular anthropological find stored on-board the baggage car. The scientist who found the specimen was played by Christopher Lee with Peter Cushing his colleague and fellow researcher. Through Lee’s character Saxton trying vainly to keep the finding secret from everyone the specimen suddenly becomes aware and soon begins the wreak deadly havoc on the passengers on-board. The film shares some clear similarities to the Joseph W. Campbell, Jr. scifi novella Who Goes There? which also was the direct inspiration for John Carpenter’s The Thing a decade later. One thing about this film which remained terrifying was how it treated the victims of the entity that awoke from within the specimen. I would say that the zombie-like state the dead victims returned in makes for some of the more terrifying images from horror films during the early 70’s that didn’t rely too much on gore and extreme violence. It’s these scenes of the white-eyed zombies shambling from train car to train car as they’re being controlled by entity that struck me as one of the most horrifying thing I’ve ever seen. It didn’t help that I was 8 years-old at the time. But even now decades later I still get a strong, visceral reaction to that scene whenever I get an urge to re-watch Horror Express. It’s a horror/sci-fi film which has lapsed into public domain and thus makes it easy for anyone who don’t want to spend some money to buy the DVD release. It’s a fitting fillm to help usher in 2011’s Halloween and it’s also one of the last great gothic horror films of the era before the arrival of the Wes Craven’s, John Carpenter’s and Tobe Hooper’s.